Selling your future IT Strategy to the board is a great opportunity to make your mark, but your vision is unlikely to gain traction if your sales pitch relies on pure tech speak. All too often, when an IT pro tries to explain the need for change and investment – even a pro who has made it to director and has a seat on the board – communication issues arise. If your normal mode of speech is High Geek, try translating one of your most technical white papers into everyday English. If you need help you could do worse than The Economist’s Style Guide. …you’re highly unlikely to get this. So, what can you do to turn your tech speak into business speak? Long presentations on subjects outside your audience’s core competence are a waste of everyone’s time. Don’t bore the board with too much detail about how the technology actually works. What is the issue you’ve identified? How will the strategy enable the business as a whole to generate more income? How long before the organisation sees ROI? Remember the old showbiz adage, ‘Leave them wanting more’? If the board like the bare-bones of your proposal they will come back for more detail. Make sure you have all the figures, quotes, projections to hand so you aren’t tripped up by any questions that arise. The difference between strategy and successful implementation is detail. In implementing a major change to an organisation’s IT strategy there will be a lot of detail to consider. The trick is knowing when to use this detail and how to explain it. After all, a lot of people have their own agendas, interests and careers to consider. 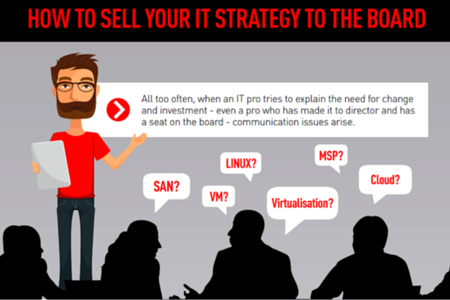 Before you present your next big IT initiative to the board, put yourself in their shoes. What do they need to hear? Review how you can make tech talk accessible and appealing to non-technical colleagues. Keep your presentations short and sweet. Focus on the business case for your IT strategy.